The Middlewich area was important before the Romans came because it was a crossing point on the River Croco and the River Dane. It was also on the track way to the lowest natural fording (crossing) place of the River Mersey at Warrington. Crossing points on rivers were of greater importance in the past than they perhaps are today. Middlewich was on the route between many Celtic tribes. The Cornovians (and other Celtic tribes) showed a degree of sophistication in terms of their craftsmanship as pre-Roman finds in Middlewich demonstrates. The Cornovians were not part of earlier Celtic client states in the South East so when subsidies were withdrawn they were not affected. Thus their experience was different to that of Boudicca and some other Celtic tribes. The Cornovians seem to have got on quite well with the Romans and were gradually assimilated through marriage etc. The Celtic tribes varied considerably in their attitude to the Roman invaders early on. Much of the early Roman traffic through Middlewich was to quell the warlike Brigantes who ruled the area to the north of Middlewich. Roman troops were often not Italian. Roman occupation was over many hundred years and there were changes within that period. The Romanisation of Middlewich was complete by the 3rd and 4th centuries though remoter farmsteads may have retained their traditional ways. The end of Roman Britain was not sudden; it was a slow decline. Reconstructive drawings, the replica items in loans boxes and similarly the exhibition ‘Middlewich Salt and the Roman Legacy’ are the result of careful and educated guess-work. What is their value? What are their drawbacks? These are issues that should be discussed with the children. Of course the same is true of historical writing generally. A good historian makes it clear what is hypothesis and what is established fact. The constant striving to get a clear picture of the past is the essence of history. Knowing exactly which names the Romans gave to places is quite difficult. The names they gave to Middlewich and Northwich are a case in point and as yet are not completely resolved. Condate (meaning “Place at the confluence of two rivers”) is often thought to be the name for Roman Northwich and Salinae (meaning “Salt springs”) the name for Middlewich. 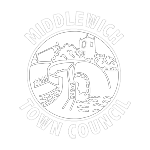 The debate continues and is described in detail in Roman Middlewich by Tim Strickland (p.8) copies of which can be obtained from Middlewich Town Council or Middlewich Library. Salt was already being produced before the Romans arrival and traded as further afield as Droitwich and Poulton. The Romans established their own Salt working area on a much larger scale. Salt was not the only commodity being produced in Roman Middlewich. There is archaeological evidence of leatherworking, ironworking and grain production. As a main artery Middlewich will have seen some of the ‘crack’ regiments and important individuals pass through even if it was not such huge importance as other Roman Settlements. Middlewich is seen as a Roman Military Settlement or Vicus. As part of the trade supply chain, even after the fort was removed the Vicus retained its importance going into the 3rd and possibly 4th centuries.